Delicious cakes & treatsfor all ages!At Yum, we like nothing better than spending an afternoon baking some delicious treats to tempt family and friends. Our cakes and treats are guaranteed to be scrumptious and fun. 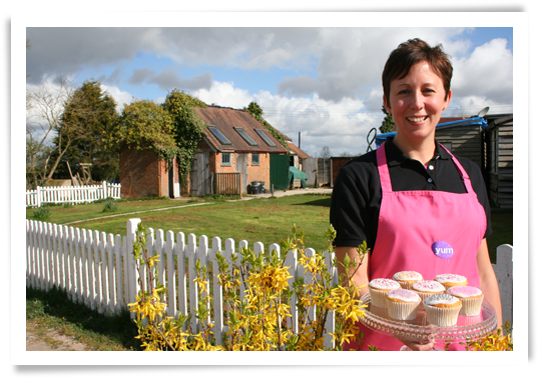 Homemade cakesfrom the New ForestWe use only the finest ingredients to produce high quality, tasty homemade produce. Yum supports Hampshire and New Forest growers and producers. Wholesale supply for local businessWe can supply products to your business on a weekly / bi-weekly basis. Since 2007, we have been busy creating a wide selection of mouth watering produce from cakes and bakes, to party buffets and children’s themed party food. Everything is homemade and has our special ingredient – food passion. Check out our new menus today. We are proud to be serving refreshments and cakes at the New Forest Transition Group - From Trash to Treasure day, at The Lymington Centre on June 12th. Great fun with plenty of sprinkles and icing sugar. Call Nicola today to find our more. Looking for a children’s party with a difference, what could be more fantastic and memorable than a cookery party! Our parties are designed to be hands on fun and each party typically lasts 2½ hours, including time for the little cooks to enjoy their creations. Call today to find out more or to book a party.